Pioneer4You IPV8 Box Mod Review - Daily Vaping Deals & The Best Vape Product Reviews at Vaping Cheap! Pioneer4you have released the newest contender in their IPV series of box mods. As a follow up to the IPV6X, the IPV8 sees the YiHi SX330-F8 chipset on board – providing up to 230 watts of output and a suite of temperature control options. This mod is one of the smallest high powered mods currently available in the marketplace. We are going to dive down and have a look at some it’s features and talk about how it performs. A big shout out to GearBest for sending this mod my way for the purposes of this article. Check Out the Pioneer4You IPV8 Here! Click Here to Check Out the Pioneer4You IPV8! The packaging for the IPV8 was fairly plain and un-interesting. I’ll be honest and say I don’t like how dull and boring it was. With nothing bright or interesting that stands out on the box, I was hoping the mod inside would make up for that. I’m glad to tell you it did. Picking up the IPV8, I instantaneously felt quality manufacturing and a very good looking mod to boot. Very sleek and stylish, the IPV8 definitely stands out from other box mods on the market. Available in Matte Black, Matte Brown and Volcano Red, the IPV8 also offers a faux leather/felt hand rest. I personally like the feel of this feature, it’s a nice touch and it certainly aids in reducing fatigue from holding the mod. The soft finish not only helps you grip the mod, it provides a soft surface for the natural curve of your hand. The benefit of this ergonomic section is that it is also visually appealing and helps this model stand out from the crowd The only downside I seen this is that it can attract dust and dirt and may have to be cleaned often. This is easy cleaned with a damp cloth and comes up looking brand new again if you need to clean it up. It’s quite possible mine started looking dirty because it was the black version, hopefully the other color finishes do not face this. Another point on ergonomics is that this mod is definitely pocket friendly. Having such a narrow profile for a dual battery mod and the way the body is designed, you will have no issues pulling this mod out of your pocket or sliding it back in. I also consider this to be relatively light for a dual battery mod, which is another plus for your pocket! The face of the mod houses the screen and the selection +/- buttons. The fire button is on one side, opposite to the felt coated side where the usb port is also located. A very minimalistic design and seemingly very straight froward to use. The spring loaded 510 connector is elegantly located in the center of the mod, not placed off to one side like many others. I personally like this as it adds a degree of symmetry to the whole setup, others may beg to differ. The connector is nicely finished with a simple 22mm stainless border, nice and simple with no juice catching feature. Five clicks on the fire button will turn on the mod and similarly enter the menu whilst on. Once in the menu, the fire button scrolls through the menu, while the up and down buttons select the menu choices. Initially I found the IPV8 slow to respond to button presses and to scroll through the menu. Once I had in mind that it was not one of ‘the other’ brands of mod on the market, I came to enjoy it’s relaxed pace. It’s just the way this chip operates. Once you hold the button down for a second, the device will scroll fairly quickly through its range. For me, and this may be a subjective con to this device, is the fact you have to go through the menu system to turn it off. I have to admit that I would prefer it to be a five click turn off feature as with most mods on the market. I don’t like that you have to pay attention to the menu to simply power the device down. With other mods I know that, at a pinch, when I click it five times I know that it’s off and will not respond anymore. I would have liked to see this on the IPV8 but again this reminds you that your not using a standard run of the mill device that acts like all the others. Temperature Control mode sees support for the usual non-resistance TC compatible wires. Offering preset modes for Stainless Steel, Ti and Ni wire. 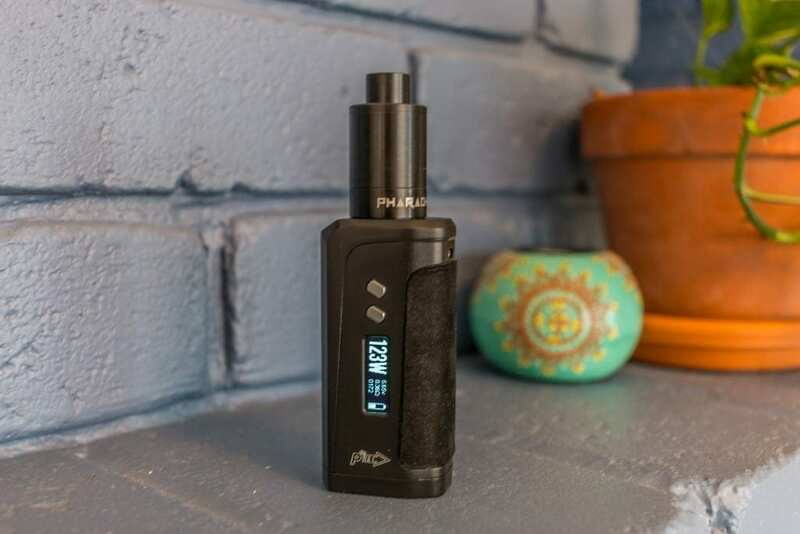 You also have the ability to dial in your custom TCR values if you are a seasoned vaper who likes to tweak things to the last infinite detail. I find the standard TC modes work well for my usage without having to go into custom TCR values. I would have liked to see this mod feature a preheat function though, although this may not be a con for others. Remember that this mod measures TC power in Joules, if your not used to using joules mode, it can take some getting used to. You set the degrees in the menu and then instead of choosing wattage level, you chose joules. It’s just another way of delivering temp control along the lines of most other Pioneer4you family of mods. The screen is a beauty, containing everything you need to know and brings up the most important data in the biggest font. It certainly is very bright and gets brighter when you push the fire button. It’s easy to read in the bright sunlight, and certainly easy to see in a dark environment. The battery door and connection mechanism is very solid and provides a snug fit for your batteries. It is clearly labelled with + and – signs, so there is no confusion as to which way you need to orientate the batteries. This mod features reverse battery protection in the event that the batteries are inserted the wrong way. I really like the fact that the battery door is hinged which means there is no chance of it going missing if it were a separate section. This brings me to rattles. Everyone hates a rattly mod, whether it be from the battery housing or from the buttons. The IPV8 offers a solid and snug fit to your pair of 18650 cells, which means they cannot rattle around in the housing. Although the buttons are nice and clicky, in no way are they loose ensuring no rattle emanates from them either. The IPV8 was able to accommodate all of my atomizers, giving them a flush connection and leaving no gaps. The 510 connection is nice and sturdy for all sizes that I tried from 22mm to 25mm. Every atty I tried on this mod definitely looked at home and were quite comfortable sitting on top. Unlike some mods on the market, the IPV8 provides you with full power right through the battery range. You don’t have to worry about getting compromised power output when your batteries are depleting. It will get to a point and advise low battery, obviously you can monitor this on screen, and then just swap it out. The IPV8 counts your puffs and on average I was getting over 300 puffs per charge while running an 0.2 ohm build in wattage mode around 50W. For me, this seems about the right, if not more, performance for this type of build and the batteries I was running. The puff counter is reset each time you replace the batteries. I found the mod to perform very well both in TC and Power modes, I do not own any ‘SX pure’ attys so I was unable to test this feature out. It similarly did well for both tanks and RDA’s. I found the IPV8 to hit as hard and consistently as say a Realaux RX200S or a SMOK Alien, in both power and TC modes. The power is delivered quickly and efficiently with no sign of a depletion curve or weining output. If you are consistently vaping at high wattages and your atty is prone to getting hot, the IPV8 will also act like a heat sink and get hot too. I decided to try out vaping at 200W with a SMOK TFV8 and was only able to take one drag before the mod read ‘Too Hot!’. So I don’t know how sustainable super high wattage vaping is on the IPV8, I guess it would depend on your build and how your atty handles referred heat. Pioneer4you does not offer any firmware updates for the IPV8, so you are stuck with its functionality for the life if the mod. There is no pre-heat function, which could be a con for some people. This feature is becoming very popular in the market these days and I’m surprised to not see it included. I found the ohm reading to be on point with the other box mods I own and have not experienced any ohm jumping here either. The durability of the zinc alloy construction means that this mod will be able to take a beating. The paint is finished well and is quite hard to scratch, even the base was not scratched after a few weeks of standard use and abuse by me – so I think that is a testament to the finish quality as a whole. Overall I was very happy with the usage and performance of this box mod. I was not left unsatisfied or frustrated at all from any issues faced or lack of performance. For the price point, I don’t think you will be disappointed in what the IPV8 has to offer. It covers most, if not all, of what the average vaper is looking for or needing in a dual battery mod. I do not hesitate to recommend this mod to anyone who is thinking about trying one out. It will not disappoint. So if you’re in the market for a dual battery box mod, I highly recommend checking out the Pioneer4you IPV8 Box Mod. I hope this review helps you in finding the perfect device for you! Feel free to leave any questions or comments below. Thanks for reading!